How is karate different from other martial arts? Is this style of karate a good one for me? How do I pick a good school? Is there danger of injury? What are your qualifications to pontificate about all of this? No (as of the time of this writing - we have in the past and could in the future). We do not have separate classes for children (or for women), so everybody (men and women of all ages) train together. We will take younger students when they are 15 years old (with parent or guardian approval), as by then they have developed the self discipline, physical size, and their bones and bodies have matured enough to train. We would be happy to provide a recommendation for schools that do have classes for children. Just contact us via e-mail or telephone, and let us know. Karate involves defending oneself via blocking, and counterattacking using punching, kicking and striking techniques. Power and speed are optimized by employing correct body mechanics and alignment. 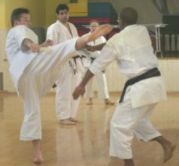 Particularly the employment of kicking techniques characterizes karate. Typically, a student of karate fights at kicking distance (as opposed to say punching distance or grappling distances which are much closer). Karate training is divided into three aspects: basics (kihon), sparring (kumite) and forms (kata). 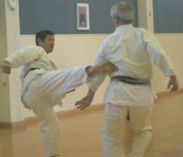 Kihon entails the practice of the basics of stance, blocking, punching, kicking, striking, moving and stance. Kumite involves prearranged attacks and defenses at a lower level progressing to free sparring (free exchange of techniques with a partner) at higher levels. Kata are the prearranged sequences of defensive and offensive techniques that preserve and encode our style. Classes range in length from a half an hour, an hour, and 1.5 hours. Classes are held three times per week. We recommend attending two to three classes per week (especially in the beginning) if possible, as much of the learning is by rote and repetition in the beginning. But we also recognize the importance of work and family, so set up your schedule as you can. There is a philosophical aspect of karate-do (the way of karate) training that is not spoken about much in our dojo (school, literally the place the way is taught or pursued), but rather evinces itself in the way the instructors and students interact with eachother. This is a subtle thing, and highly individual. E.g., karate training can be utilized and viewed as a way to "polish one's soul". In many dojos, this is actually given more formal recognition through the regular recitation of dojo kun (precepts) and through a more elaborate meditation ceremony at the beginning and end of class. 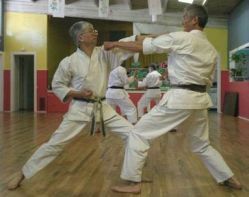 The founder of our style (Shotokan) of karate might say karate is for everyone, as he designed our style to be accessible to everyone: men, women, children and seniors. Personally, based on my experience and observations, I would say that karate is not for everybody. It tends to appeal to those who have (or are trying to develop) a fair amount of self discipline. While it can appeal to both goal oriented and process oriented personality types, probably the process oriented folks tend to stay around longer (i.e. achieve advanced rank). If you are seeking instant gratification or easy answers, the answer is definitely no. Karate takes a lot of diligence and sweat (and a decent sense of humor helps! ), and the difference between success and failure is usually found in how regularly one attends and how diligently they practice, as well as in cultivating an attitude that sees success in terms of progress relative to oneself rather than as something measured against the accomplishments of others. If you've ever wanted to try karate or the martial arts, this is a great opportunity to do so as it costs nothing but your time to try it. Our style of karate, Shotokan, is known for having strong basic techniques and methodical training to that end with standardization and consistency across the broad spectrum of schools and organizations that practice our style (i.e. 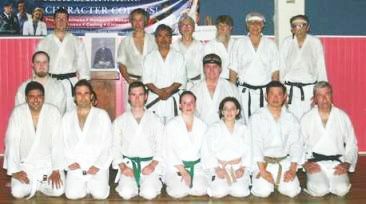 you should be able to find a Shotokan school or club in almost any good sized city). It is a "power" style (also said to be a "linear" style by outsiders), with an emphasis on developing the power to quickly and effectively finish off an opponent. It is also a "traditional" style, with standardized and traditional "forms" (aka kata) that preserve and transmit the style. That being said, if you are just starting out in the martial arts, the style of karate (or even martial art) is probably not as important as the quality of the school and instructor(s). Since you will be spending a lot of time over potentially years there, you want to make sure that both the instructor(s) and students are the type of people you want to spend time with, and that they treat eachother with respect. Also, that you get to go home with a full set of teeth every training session! A beginner will probably not be able to discern that much about a particular style of karate (or even martial art). It takes a while (I would say roughly a year) to develop an eye for observing and beginning to understand what you are seeing when you watch martial arts. If you decide later on that some other style (or school) of karate or martial art would be more suited to your goals you can change then. But make sure that first and foremost you pick a quality school (and instructor(s))! No contracts: Payment should be on a month to month basis, with no long term contract or payment such that you may quit at any time if you desire. If they ask you to sign a contract, run (do not walk) to the nearest exit! Costs should be reasonable: Be sure that the dues structure is straight forward, easily understood and readily available, and that the costs are in line with other schools (or hopefully less!). All costs (including uniform, any organizational fees, examination fees, any texts or manuals, etc.) should be clearly delineated. Also, if you like you should be able to buy uniforms and other supplies from a third party supplier, not just from the school you are evaluating. Instructors and students treat eachother courteously and respectfully: If the instructor is abusive or overly militaristic (e.g. shouting at students in a denigrating or derisive manner, or demanding tortuous exercises from students) they are attempting to prey on your insecurities. Just politely (but firmly) leave the premises. Training and exams open to all observers: You should be able to observe all classes and exams without having to join up first. If not, they are trying to hide something. You can speak freely to any of the instructors or students: If not, they are trying to hide something. Instructor does not cop an attitude towards newcomers: If the instructor acts evasively, strangely or mystically, they are a phony or head case, attempting to prey on your insecurities or ignorance. You should be able to interact with them off the training floor in a normal and friendly manner (e.g. as you might with a parish priest, rabbi, minister, teacher, etc.). Look out for conmen and cults: If the instructor(s) or school attempts to assert that their school goes way beyond teaching karate techniques and philosophy or if there is an attempt to dominate one's social life (so that they control your life outside of the karate school) politely but firmly leave. Karate-do should enhance one's life, not become an obsessive end all. You should have a fulfilling life outside of karate. They should answer all your questions: If they don't answer all of your questions in a concise and clear manner, you won't understand their instruction if you sign up to train there either. Free lesson with no strings attached: Many reputable schools will allow you to take a class or lesson so you can evalute further whether this is the school for you. DO NOT make any commitment long term when starting out! The majority of novices decide karate is not for them after one to three lessons (which is why we offer a week (three lessons) free so you don't waste your money figuring this out). If you train long enough, odds are you will be hurt at some point as in any other athletic endeavor. The types of injuries we see most often include blisters on the feet (from moving on the floor), sprains, muscle pulls, bruises, tweaked backs and knees, et al. If you train long enough to earn a black belt, there is a good chance you will experience nearly all of these joys, and possibly even more serious injuries such as a broken bone or problems with the knee or back. 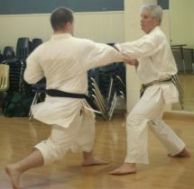 Although we practice a non-contact ("point" sparring) style of karate, there is still accidental and inadvertant contact. This is pretty much unavoidable and in the nature of the martial arts although outside the scope of the curriculum. I would say the injury potential is quantitatively and qualitatively about comparable to high impact aerobics or dance. No, although we have considered (and continue to consider) such events. Students are free to participate in any tournaments they would like, but we do not require or pressure any students to do so. We do not want to develop a situation where "more gifted" students (with respect to competition) are given elevated status or attention. Personally I believe that competition can be fun, and serve as both motivation and as a way to meet others who enjoy the martial arts. However, it is important that students do not become obsessed with winning and losing. Most students never earn a black belt. 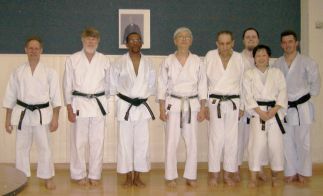 We do not guarantee that students will make black belt (or any other) rank. Earning a black belt is a relatively rare occurence, although the primary trait to be able to achieve black belt rank is simply the ability to show up for class regularly, avoid serious injury and to train diligently. Typically, it takes 5 to 7 years for most folks to earn black belt rank. Theoretically this can be done in just 2.5 years given our testing schedule, but I can recall only one person who was able to do this. We used to have a rule of thumb of roughly one in a thousand (I sure better now) for the odds of achieving black belt to give you an idea of how rare this is. Consider how rare it is to train diligently and regularly at anything for 5 to 7 years. Conceptually that's not hard, but the reality is that it is not often done. However, if you have the self discipline to do that, accomplishing this (or anything else in life) is pretty straight forward! Dues: You may try a week for free with no strings attached. After that, it is $50 per month (as of this writing) for 2 to 3 days of training per week for beginning students ($65 per month for advanced students), which is what we recommend for beginning students. Uniforms: Lightweight uniforms (which is what we recommend for beginning students) are under $20 through us. You do not need a uniform initially - you may train in loose fitting exercise clothing like gym shorts or sweats. Heavier weight uniforms or other brands may run as high as almost $200 (e.g. if imported) depending upon the make and model. The heavy weight uniform that I (and a number of other students at our school) wear is under $40. Rank examinations: $5 and given every three months for ranks under black belt. They are $10 for given every six months for black belt ranks. You only need to take examinations when you feel ready to advance in rank. Come to the first class of any given day about 10 to 15 minutes prior to class start time. Wear loose fitting exercise clothing like gym shorts or sweats. We'll have you read and sign a standard athletic waiver form and fill out an information sheet. An assistant instructor will work with you one on one for the first couple of lessons until you can follow along with the regular class. The class schedule, directions to the school and parking are elsewhere on this website. If you can, let us know when you are coming down, and we'll make sure that the instructor knows to watch for you. Otherwise, just show up. The toughest step in karate training is stepping across the dojo (school) threshhold the first time. After that, it's just showing up regularly. If you've actually read this far, you might as well give it a try - you're certainly interested! We hope you'll take that first step! I'm the webmaster of this site and as such (and like any other webmaster) can say pretty much anything I like! 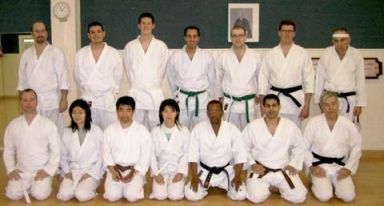 I've been a member of West Los Angeles Karate School for some number of decades now. I am currently a student, instructor and administrator there. I have never been a champion of any kind (that's me being scored upon in the photo to the right), and do not consider myself particularly talented at the martial arts. I do enjoy helping folks find their way on (and sometimes off of) the martial arts path, as I recall how exciting, beneficial and fun it has been for me. Seeing folks progress and succeed at something they have always wanted to do is quite rewarding. A lot of time and thought has been put into these with the intent of helping YOU! If you come across any other good ones, please let us know so we can add them to this FAQ. If you have any comments, questions, corrections, or additional topics that should be covered in this FAQ, please let us know via e-mail or telephone!